Supplemental examination in applied geometry is required before completion of the bachelor's degree programme if this subject was not completed satisfactorily with at least 4 credit hours at a higher-level secondary school ("Oberstufe") after the eighth grade. the second admission takes place at the LFUI. Tuition fees are to be paid at the UMIT. 2. Fundamentals of Electrical Engineering 1 (VO2, 3 ECTS-Credits, § 7 par. 1 no. 4 lit a). (2) Successful passing of all exams of the Studies Induction and Orientation Stage entitles to passing all further courses and examinations as well as to writing the Bachelor's Thesis. (3) Before successful completion of the Studies Induction and Orientation Stage courses amounting to 22.0 ECTS-Credits may be passed. The requirements specified in the curriculum must be met. 2. Technical Informatics 1 (VO 2, 3.0 ECTS-Credits, § 6 par. 1 no. 3 lit c). (1) Depending on the chosen field of specialization the compulsory module A1 or A2 covering a total of 10.0 ECTS - Credits must be passed. (2) Depending on the selected field of specialization the elective module A1 or A2 covering a total of 5.0 ECTS - Credits must be passed. The Bachelor's Programme Mechatronics is a joint study programme of the University of Innsbruck and the UMIT - The Health & Life Sciences University. Mechatronics combines all approaches and techniques to develop systems, procedures, devices and products where the essential characteristics are to be achieved by the integration and interaction of mechanical, electronic and information-processing components. By integrating the methods and techniques from the formerly independent technical disciplines, the development of modern systems with a high degree of functionality, efficiency and performance is made possible. The synthesis of the engineering disciplines mechanical engineering, electric engineering and computer science, which is also based on the natural science disciplines mathematics, physics, and chemistry, reflects interdisciplinary technological challenge in modern process and equipment technology and is a key motor of present and future product innovation. In order to meet the high requirements of the bachelor's programme, natural scientific as well as engineering competences are developed and promoted with the university training. Moreover, particular importance is attached to the development of social competence due to the interdisciplinarity of the study programme. Graduates are able to elaborate, evaluate and implement scientific developments in the core fields of mechatronics and to apply them in interdisciplinary contexts. They possess scientifically well-founded theoretical and methodical problem-solving skills in order to apply, after a short introductory period, different fields of mechatronics and mechatronics-related fields of mechanical engineering and electrical engineering in industrial and trade companies. 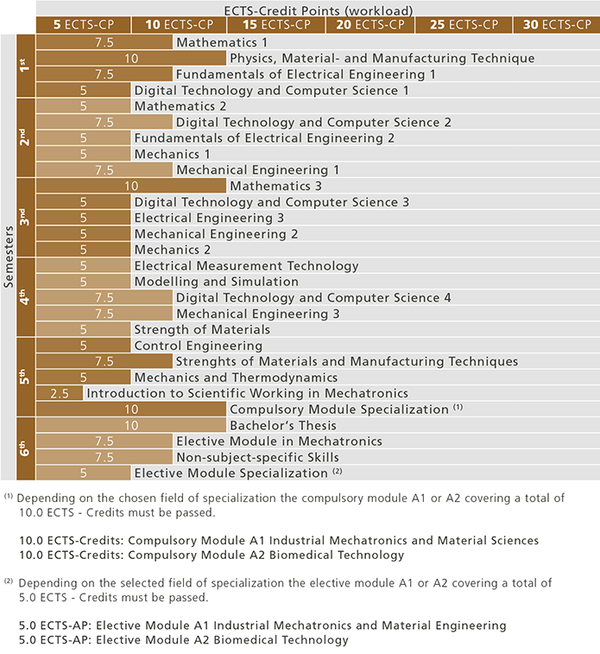 The career fields of graduates of the Bachelor's Programme Mechatronics cover a wide range of activities. Based on their university training, they are in particular qualified, after a short introductory period, to actively take part in different fields of mechatronics and mechatronics-related fields of mechanical engineering and electrical engineering in industrial and trade companies. Graduates of the Bachelor's Programme Mechatronics are also prepared for a relevant master's programme.